Murdoch Mysteries’ Simon McNabb discusses “Concocting a Killer” | TV, eh? 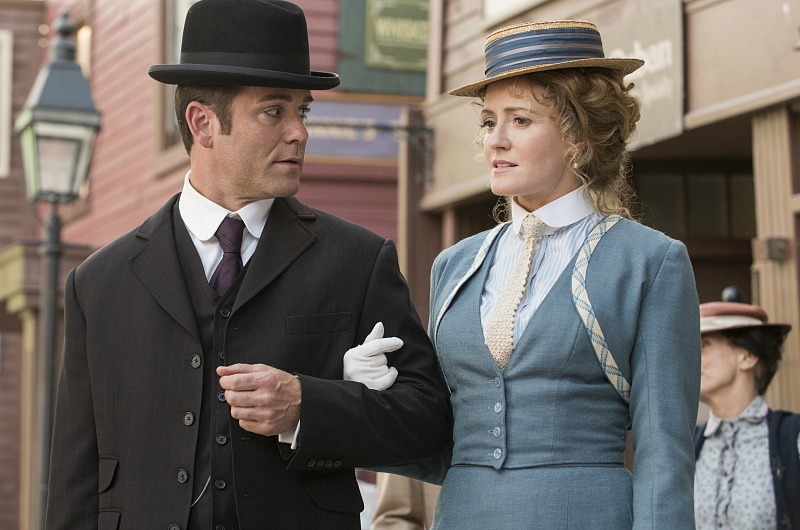 Murdoch Mysteries fans are used to seeing William and Julia solve every crime placed in front of them by using their wits and technology. But what if technology failed and caused them to imprison the wrong man? That was the thrust of “Concocting a Killer,” as Gus Shanley (Jonathan Goad) was sent to jail for killing his friend with poison-laced cocoa. Monday’s new instalment also introduced viewers to Det. Watts (Daniel Maslany), who—despite being a great detective in his own right—could not have been more different from Det. Murdoch. We got Simon McNabb on the phone to discuss his episode and what’s to come next week. This was a great episode. ‘A Study in Pink’ was pretty heavy, with a lot of aliases and characters floating around and ‘Concocting a Killer’ felt lighter and with a bit more humour. And I liked the fact that William and Julia may have made a mistake 12 years ago. Simon McNabb: The whole idea for ‘Concocting a Killer’ was to explore the idea that Murdoch and Ogden may have made a mistake at some point in their careers. We’re so used to watching these stories with them where their theories along the way may be or incorrect, but at the end of the day, they’re always right. The inspiration for this episode was, ‘Well, what happens if that’s called into question?’ We explored how to do that and an interesting way. The most fun part for me was figuring out what that self-doubt meant for them as characters. How did they each approach it? Murdoch is usually so logical, but is there an emotional angle to his response to being wrong and he’s not used to that. I thought it was nice to see him get his back up, both for his own conviction and his confidence in Julia. Let’s talk about Daniel Maslany as Det. Watts. I’m glad he’ll be back because he was quirky, feisty and Murdoch’s polar opposite when it comes to his investigating style. And Daniel was really great in Four in the Morning playing a somewhat similar character. It was a long conversation in the writers’ room about how to bring in a detective who could play off Murdoch and, as you alluded to, be his opposite and not be a terrible detective. With Murdoch being the most brilliant detective in Toronto and the world, you could bring in someone and have him be a bad detective or you could make him rough and tumble like Brackenreid. So we thought about how to come up with someone who is totally unlike Murdoch but still very much a classically great detective and in the mold of your Sherlock Holmes’. We found a nice balance. He’s a character who is a little hard to get a handle on with regard to what he’s going to say—he’s a bit of a loose cannon and has very little in regards to social graces—so it was really fun to see them play off each other and I think the actors did too. Regarding Daniel, we hadn’t seen Four in the Morning when he was cast. I think he was either still shooting it, or the episodes were in the can but no one had seen it yet. It was only when we saw the show when it premiered that we realized there is a bit of similarity in character there … he’s a bit of a live wire. But, if you get to meet Daniel, he couldn’t be further from that. He’s very calm, very polite, kind and gracious. Even though he has that energy in him, he’s nothing but a calm, cool, professional on set. Yannick doesn’t often get the chance to do comedy on Murdoch Mysteries; seeing his facial expressions as he reacted to Watts was pretty enjoyable. For me, I think Yannick is hilarious. He has perfect comic timing and instinct and he gets to play the heroic lead on this show which means he doesn’t get to do the comedy the other guys get to do. [Laughs.] Yeah, I guess that could be his ‘Bloody hell!’ if he sticks around long enough. We always think of Murdoch as leading that front edge of technology, but this episode showed that, 12 years ago, the technology wasn’t there with regard to the spectroscope and analyzing metals. What can you say about Episode 5? The episode is called ‘Jagged Little Pill.’ Rebecca James is in her second season on the show and one of the things that we wanted to do in Season 10 was give her a least a couple of opportunities to really shine and do something cool and interesting and have a pivotal role in one of our stories. In part because we think Mouna is great and in part because we thought the episode she headlined least year, ‘Colour Blinded,’ turned out really, really well. Was the Shanley character (released murderer) played by the same actor as the older Beaton brother in the Curse of Beaton Manor episode? Thanks Greg. based on that IMDB photo and the shots from Republic of Doyle I would not have recognized him.